As always, it’s important to think about what the primary function of this area will be. Are you a chef-in-training? 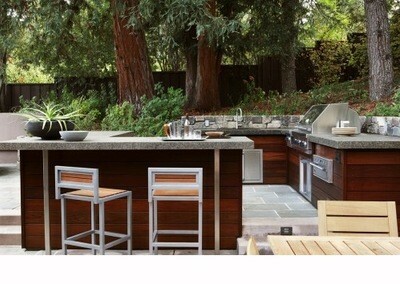 Then focus on the kitchen appliances, materials and layout. Do you plan on throwing dinner parties? Will this be near a pool? Will it just be an area to lounge, eat and relax? 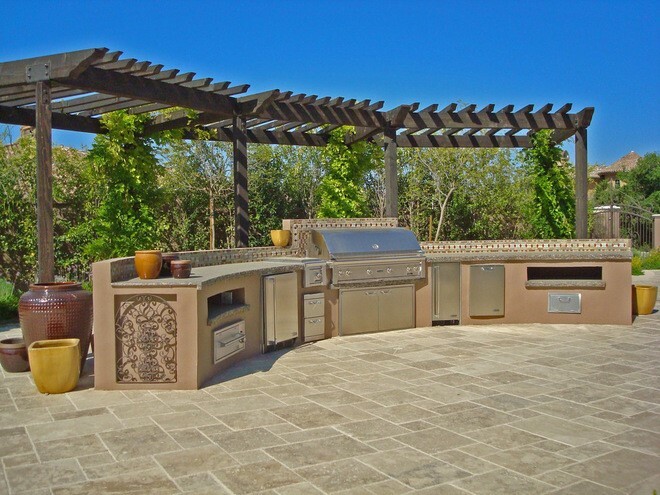 Once you figure this out, you can choose your must-haves for each area and which portion of your outdoor kitchen you’ll want to focus on. 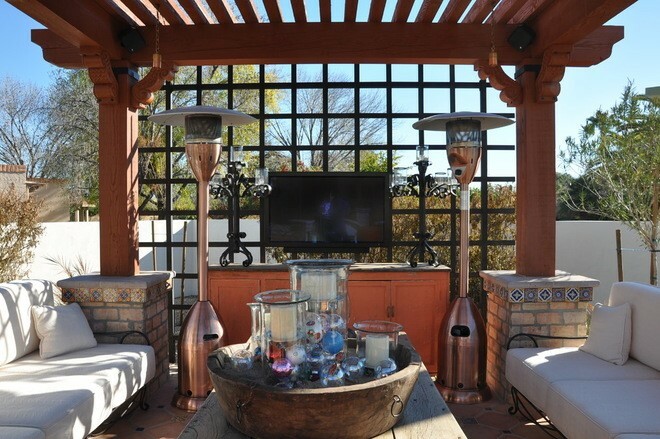 … or simply add an awning, umbrella, or another temporary option. 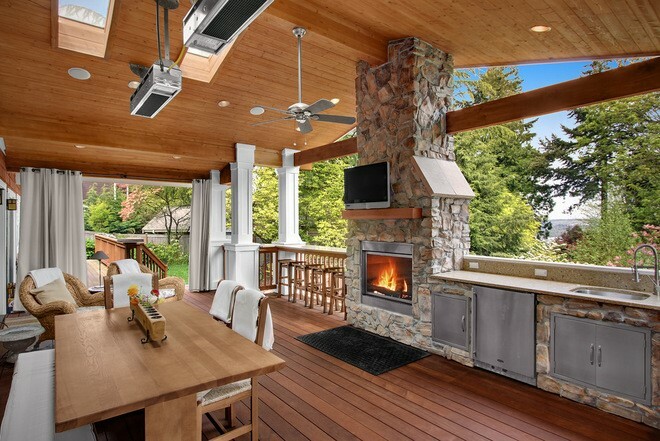 Of course, make sure you’re not using any kind of combustible material for the ceiling or awning above the grill area, and make sure the area is well ventilated. Including other heating sources is always a good idea — it’s usually better to provide too many ways to warm up than too little! Try placing them near seating or dining areas for ultimate functionality. The appliances in your kitchen are going to be a very important investment. Quality is going to be more important than quantity here. Yes, it’d be fun to go crazy and get a rotisserie, warming drawer, AND a pizza oven — but do you really need it? Get what you’ll actually use, and make sure that it works well, and is made for the outdoors. If you’ve remodeled an indoor kitchen, you know how important it is to have the right amount of counter space — the same goes for the outdoors! Dry space should be a top priority, particularly prep surfaces. 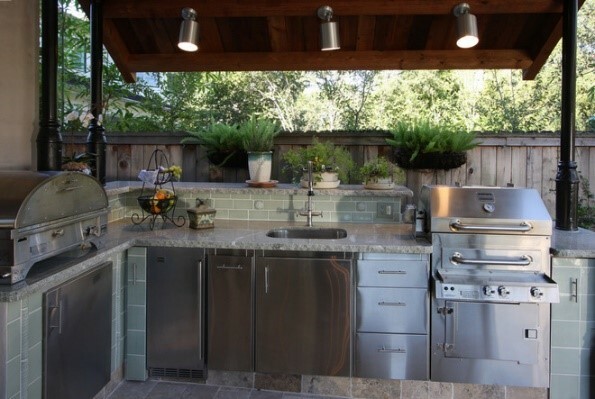 This outdoor kitchen has plenty of space to chop up vegetables and meat, mix drinks, and have a little serving station. 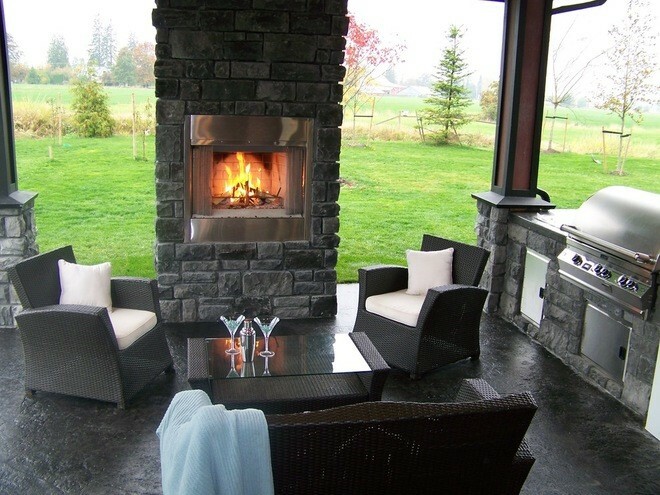 In terms of materials, everything needs to be durable, weatherproof, heat resistant, and easy to clean. 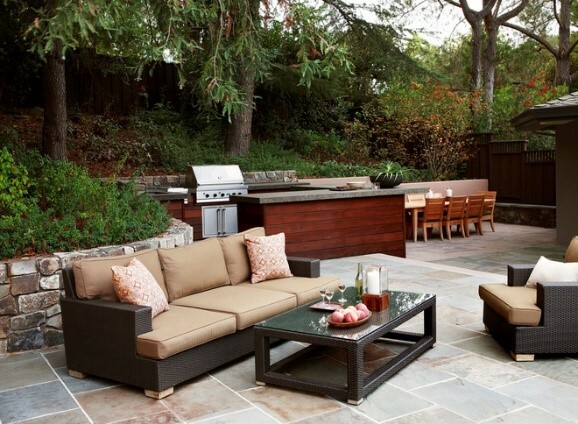 This means rot resistant wood (such as teak, redwood, or cedar), stone, and stainless steel. Also, think about how hot materials get in direct sunlight, or even just warmer temperatures. 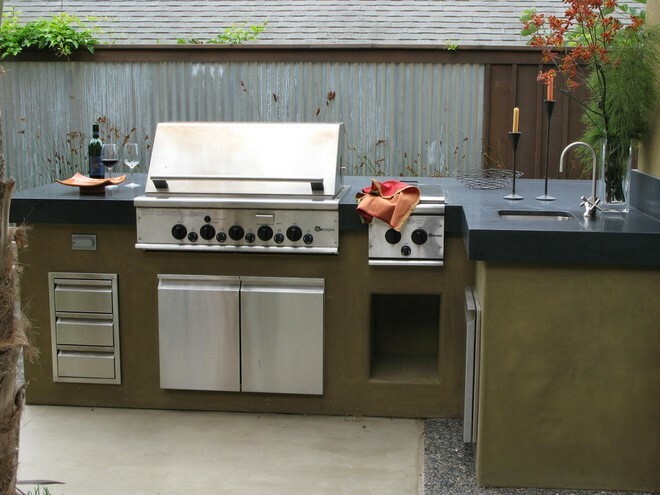 Since you’ll most likely be using this during the summer, you don’t want to build your backyard kitchen out of something you’ll barely be able to touch! 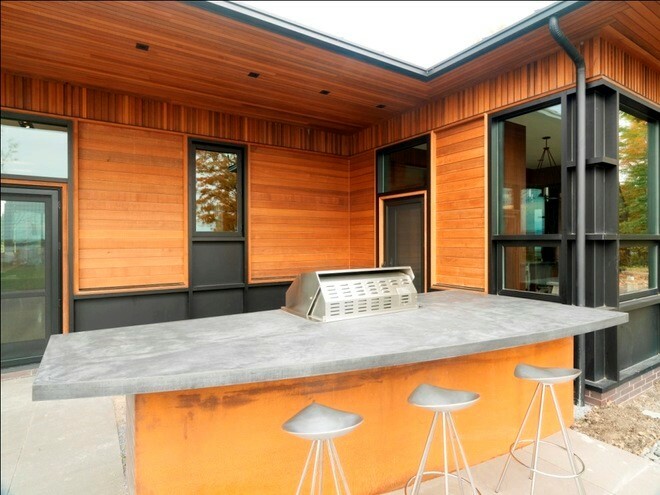 Most outdoor kitchens are going to be situated near the main house. This allows for the easy access of existing utility lines and makes it easy to transport food and other materials to the outdoor cooking area. If these issues aren’t of particular concern for you, be sure to take wind, sun, shade, and access to amenities (such as a pool or a lawn) into consideration before choosing the perfect place. 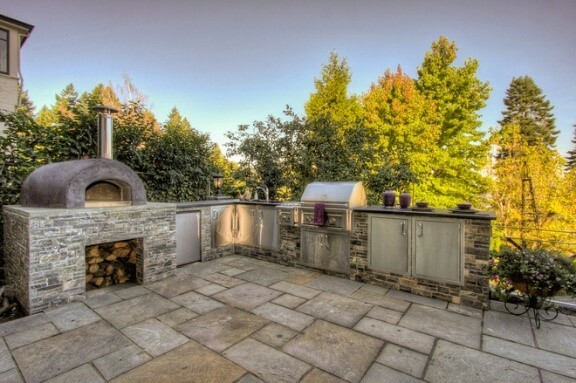 f you like to have people over, odds are you’ll be using your outdoor kitchen for a lot more than just the occasional barbecue. When you’re planning your layout and considering your must-haves, think about how you’ll be entertaining your friends (or yourself). 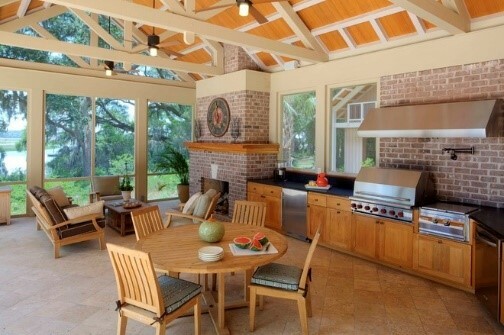 This kitchen has pretty much everything: dining table, lounge area in front of the fire, television and bar. In terms of utility, the appliances in your kitchen are going to be a very important investment. Quality more important than quantity here. Yes, it’d be fun to go crazy and get a rotisserie, warming drawer, AND a pizza oven — but do you really need them all? Be sure to get what you’ll actually use, that it works well, and is made for the outdoors. 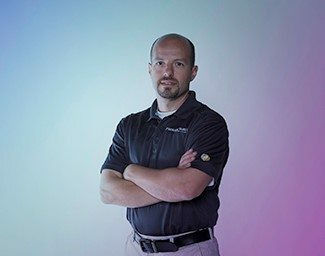 You want to be able to move effortlessly from area to area — particularly when working with a potentially dangerous medium like a grill or pizza oven. Take this into account when planning your layout — you don’t want to have to jump from place to place. This setup works perfectly: it’s simple, but everything you need is here. Try not to isolate the cook from the rest of the party! Nothing’s worse than getting stuck with grill duty and hearing everyone else having a blast behind your back. Cooking and entertaining places should be seamless, but with a decent amount of separation so there’s no dangerous moments when you’re taking the ribs off the grill. 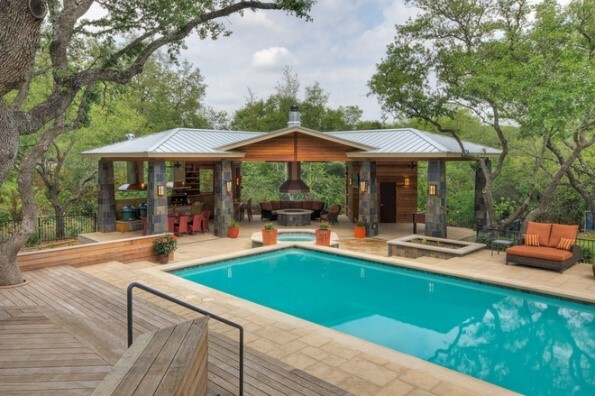 The setup in this photo works well because the cook doesn’t need to leave the single counter and grill area, but can still turn around and interact with the action at the pool. 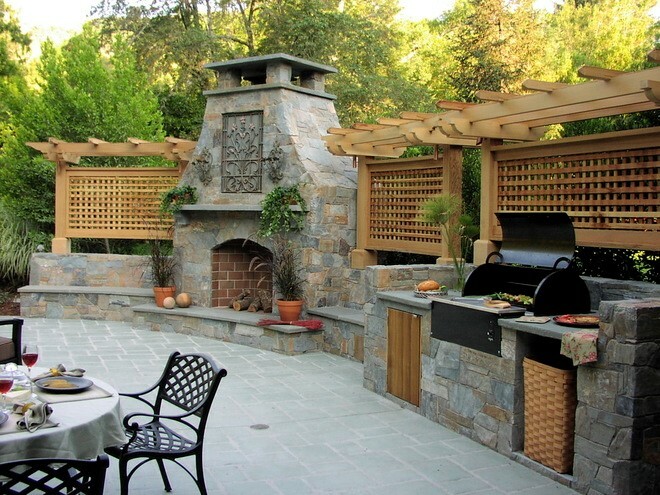 Let Ferrara-Buist landscape design and build your dream home ! Call us today or come in to our design center and have a chat with Vincent.